The feature debut of 32-year-old writer-director A.B. Shawky, which made it into competition at the last Cannes Film Festival and has since traveled to other festivals around the world is the Egyptian entry in the Foreign Language Film competition for the Golden Globes. The film tells the story of Beshay, (played by non-actor Rady Gamal) an illiterate, uneducated man suffering from leprosy who, after spending 40 years of his life in a leper colony, decides to go in search of his family following the death of his wife. 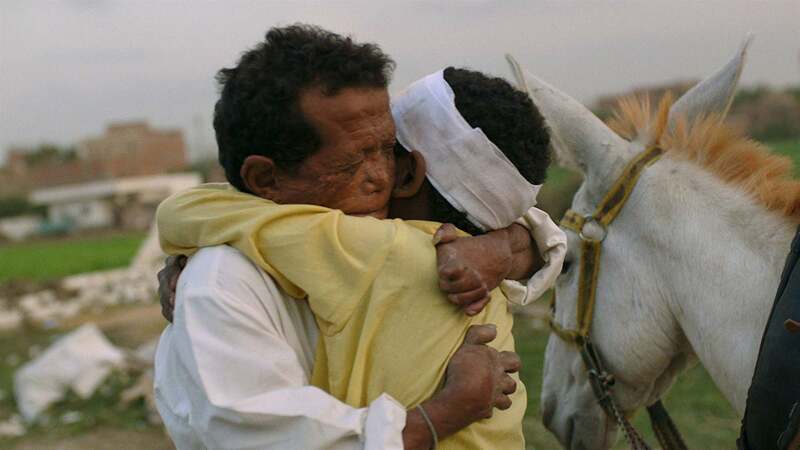 Beshay crosses Egypt to his hometown, Qena, by donkey and in the company of a 10-year-old orphaned Nubian child, named Obama (Ahmed Abdelhafiz) overcoming all the difficulties they encounter en route. This story, produced with a very small budget, was the director’s graduation project. A.B. Shawky had already completed a previous project in a leper colony. In fact, the title of the film comes from a phrase he heard there. ‘Yomeddine’, which means ‘the day of final reckoning’in Egyptian. The director heard someone saying “on that day we will all be free”, listened to people who were left there by their families, as children, and thought, “There is a good road movie here.” But it wasn’t until last year in grad school, at NYU, that Shawky decided he should do it. “In order to create the film, we had to do a huge amount of paperwork and we still haven’t done all of it”, confessed the director in our encounter, last October, at the Valladolid International Film Festival, explaining that bureaucracy is pervasive in Egypt. The majority of the actors in the film had never acted before, while others had only appeared in commercials or small roles and had other jobs in order to make a living. “The main character (Rady Gamal) is an actual resident of the leper colony – he still lives there and had never been in front of a camera before, neither had the boy (Ahmed Abdelhafiz),” said Shawky who worked with the actors for four months preparing them and teaching them what it’s like to act and to stand in front of the camera, especially the main character. “He’s used to people staring at him, but I had to make him comfortable in front of a camera, not feel exploited”, added the director.